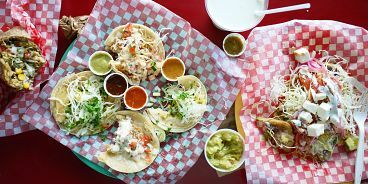 The Best Mexican Food in Vancouver? Amazing hole in the wall alert (if you’re a Mexico food lover, listen up). I’m talking about Sal Y Limon on Kingsway in Cedar Cottage. It’s not fancy, but boy is their food great. Start with a coconut horchata (which is a sweet Spanish drink made with white rice) and then get going with some extra citrusy guacamole and chips. Choose from their 12 fairly classic, mainly meaty tacos. My favourite was the fish or the shrimp that’s served breaded and doused in a creamy, zesty sauce. Their burritos are big, soft and super fresh. New on their menu is a vegetarian option called Rajas with Cream — it’s filled to the brim with chile poblano, onion, corn, cheese and cream. And it’s hard to resist going overboard with their selection of nine self-serve, house-made salsas. Try the peanut, the chipotle or the avocado.